In this MOU, JAXA and NASA agreed to strengthen cooperative ties fostered during the development of the X-ray astronomy satellite (ASTRO-H). 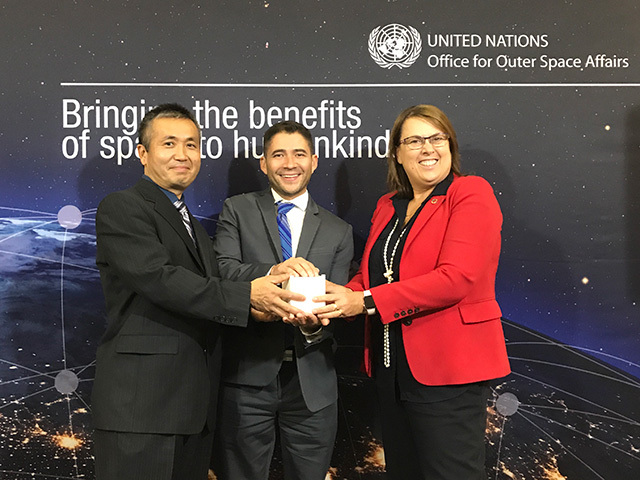 Japan Aerospace Exploration Agency (JAXA) and the United Nations Office for Outer Space Affairs (UNOOSA) is pleased to announce the opening of the fourth round of KiboCUBE. Entities located in developing countries that are member states of the United Nations (please refer to the “Announcement of Opportunity” for further details. Deployment expected by September 2020, subject to the ISS operational requirements and progress of the CubeSat development. Please refer to the following website for further details regarding the applications for the KiboCUBE fourth round (“Announcement of Opportunity”). The application due date is January 31. We look forward to receiving many applicants and contributing to the capacity building of your country! KiboCUBE programme is a collaboration programme between JAXA and UNOOSA to offer developing countries the opportunity to deploy small satellites from the Japanese Experiment Module “Kibo” on the International Space Station (ISS). A team from the University of Nairobi (Kenya) was granted e for the 1st round of KiboCUBE, and the satellite was deployed from Kibo in May, 2018. A team from Universidad del Valle de Guatemala (Guatemala) was granted for the second round of KiboCUBE, and the satellite is scheduled to be deployed in JFY 2018. A team from Mauritius Research Council (Mauritius) and a team from Surya University (Indonesia) was granted for the third round of KiboCUBE. The satellites are scheduled to be deployed in JFY 2019. Media Briefing at IAC 2018 in Bremen, Germany on October 1st, 2018. Representatives from the selected entities for second and third round of KiboCUBE gathered for the media briefing. Dr. Hiroshi Yamakawa, President of the Japan Aerospace Exploration Agency (hereinafter referred to as JAXA), and Prof. Dr. Chau Van Minh, President of the Vietnam Academy of Science & Technology (hereinafter referred to as VAST), signed the revised the “Agreement Concerning Examination and Definition of Potential Cooperation on Space Development and Application". In acknowledgement of active bi-lateral cooperation since the agreement was signed in 2006, the two agencies made the revision to include two new areas of cooperation, namely space science and public outreach, in addition to the five-existing areas, such as remote sensing and its applications and small satellite development and its applications. 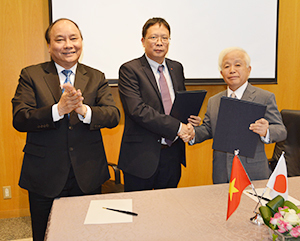 It is hoped that this revision of the agreement will further facilitate and broaden VAST-JAXA cooperation, such as in the establishment of the Vietnam Space Museum, scheduled to open in 2020 in the Hoa Lac Hi-tech Park in Hanoi, for which JAXA will provide advice on museum exhibits and the operation of the museum. The United Nations Office for Outer Space Affairs (UNOOSA) organized UNISPACE+50 from June 18th to 21st, 2018 in Vienna International Center, Austria to celebrate the fiftieth anniversary of UNISPACE I (Reference 1). More than 70 countries and organizations, and participants from ministerial level (14 participants) and heads of agencies (10 participants) participated in the conference. 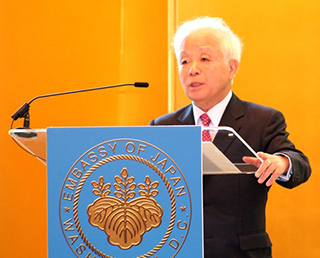 Ambassador Kitano, Permanent Representative and Ambassador Extraordinary and Plenipotentiary of Japan to the International Organizations in Vienna represented the Japanese delegation. Dr. Yamakawa, JAXA President, also participated in the conference. This cooperation was agreed between JAXA and ISRO under the Memorandum of Understanding (MOU), which was concluded in November 2016 between both agencies to promote collaboration in the space field. JAXA will provide observation data of Global Precipitation Measurement (GPM)/ Dual-frequency Precipitation Radar (DPR) and Global Satellite Mapping of Precipitation (GSMaP), while ISRO will provide observation data of ISRO meteorological satellite and ISRO’s ground instruments, and both agencies will analyze the data for improving rainfall products. Also, JAXA and ISRO will contribute to the enhancement of satellite data applications especially in the Asia region where there is heavy annual rainfall. 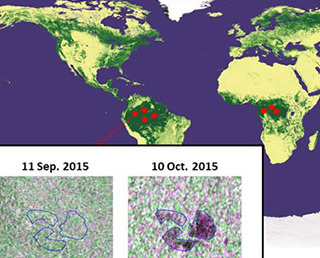 Application includes improvement in accuracy of the Numerical Weather Prediction by using satellite data. On May 1, 2018, Dr. Hiroshi Yamakawa, JAXA President and Mr. Yoshimasa Hayashi, Minister of Education, Culture, Sports, Science and Technology met with Mr. Jim Bridenstine, Administrator of NASA at NASA Headquarters in Washington, DC. Dr. Yamakawa expressed his congratulations to Mr. Bridenstine on his appointment as NASA Administrator, and they exchanged views on US-Japan space cooperation including the International Space Station (ISS) program and the future space exploration. They also confirmed that they will further strengthen the cooperation between two agencies. In addition, Dr. Yamakawa and Mr. Masaji Matsuyama, Minister of State for Space Policy met with Dr. Dmitry Rogozin, General Director of State Space Corporation ROSCOSMOS at the Kremlin in Moscow by taking opportunity of the live communication event between two countries’ leaders and the ISS. Dr. Yamakawa expressed his congratulations to Dr. Rogozin on his appointment as General Director of ROSCOSMOS, and they confirmed that they will continue the good relationship and further strengthen the cooperation in the space field. 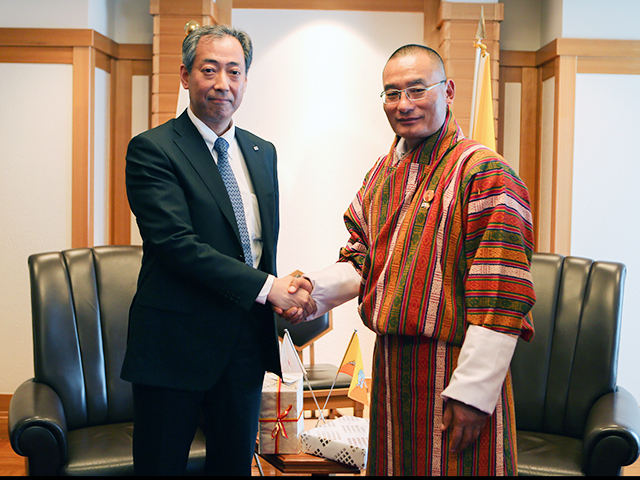 On April 11, 2018, JAXA President, Dr. Hiroshi Yamakawa met with Bhutan Prime Minister, H.E. Tshering Tobgay. Bhutan’s first small satellite (developed under BIRDS Project （*1） of Kyu-tech university) is expected to be deployed from the Japanese Experiment Module “Kibo.” Through this activity, they discussed to further advance space cooperation between JAXA and Bhutan. Also, they discussed the potential cooperation areas such as education, and they expressed expectation for enhancing Bhutan’s space program in the future. 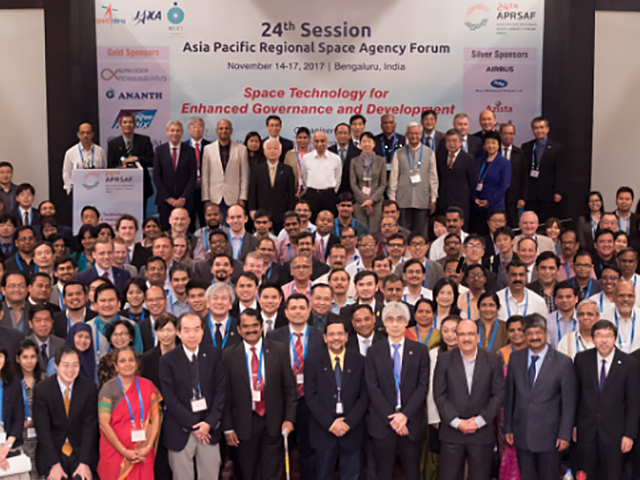 The 24th session of the Asia-Pacific Regional Space Agency Forum (APRSAF-24) was held from November 14 to 17, 2017, in Bengaluru, India, jointly organized by the Department of Space (DOS) India, the Indian Space Research Organisation （ISRO), the Ministry of Education, Culture, Sports, Science and Technology of Japan (MEXT), and the Japan Aerospace Exploration Agency (JAXA). APRSAF, established in 1993, has been growing to become one of the largest international fora today in the Asia-Pacific region. It is annually organized by MEXT, JAXA and organizations of host countries. APRSAF-24 was organized under the main theme entitled “Space Technology for Enhanced Governance and Development,” and 539 participants from 31 countries and regions and ten international organizations attended the forum. This year, six heads of space agencies and three deputy heads, as well as high-level officials from governmental institutions in charge of space policy attended the forum. The attendees shared common issues and interests in the Asia-Pacific region and expressed their expectations of the great contributions of APRSAF toward building a cooperative framework to help solve social issues. One of the features of APRSAF is the cooperative activities throughout the year by the four working groups (Space Applications, Space Technology, Space Education, Space Environment Utilization). This year, the working groups discussed about cooperative activities to solve social issues in the Asia-Pacific region and the advancement of space technology in the region. Also, they exchanged views about future cooperative areas and capacity building. On the last day of the forum, the outcomes of APRSAF-24 were summarized in a Joint Statement, which was confirmed by the participants. 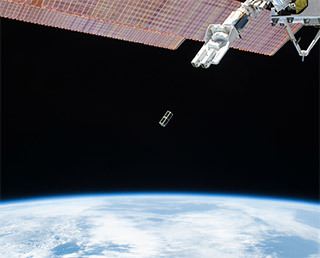 Japan Aerospace Exploration Agency and the United Nations Office for Outer Space Affairs, UNOOSA, launched a three year “KiboCUBE” programme in September 2015, which offered developing countries the opportunity to deploy small satellites from Japanese Experiment Module “Kibo” on the International Space Station (ISS). This initiative aims to contribute to the technological advancement of space activities in developing countries, and its first and second round of applications have been conducted until now. In the “Four Actions of Science and Technology Diplomacy to Implement the SDGs” produced under the Advisory Board for Promotion of Science and Technology Diplomacy of the Ministry of Foreign Affairs (MOFA), it is noted that the deployment of small satellites from Kibo will support the space technological development for emerging and developing countries. KiboCUBE is expected to also contribute to the achievement of the SDGs. On September 26, JAXA held a media briefing with UNOOSA in the 68th International Astronautical Congress (IAC) at Adelaide, Australia. During the briefing, there was an announcement of the third round of KiboCUBE along with introduction of the programme. Dr. Horikawa served as the first Asian Chairman of the fifty-fifth to the fifty-seventh United Nations Committee on Peaceful Uses of Outer Space. 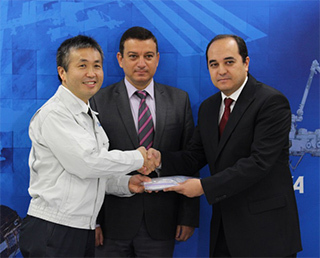 In September, JAXA and the Ministry of Transport, Maritime Affairs and Communications (MTMAC) of the Republic of Turkey signed a cooperation agreement on CubeSat deployment from the International Space Station (ISS) Japanese Experiment Module (Kibo) and exposure experiments using Experiment Handrail Attachment Mechanism (ExHAM). In this regard, samples from Tukey were handed over to JAXA today for the first joint space environment exposure experiment. This summer, JAXA initiated a full-scale technical examination and international coordination of the loading of samples toward the joint Kibo utilization project. The first experiment sample was hand-carried by Turkish officials to JAXA Tsukuba Space Center on November 2. The samples are confirmed that they are ready for the experiment in Kibo, and will be transported to “KOUNOTORI6” (HTV6) in Tanegashima Space Center, which is scheduled to be launched on December 9. 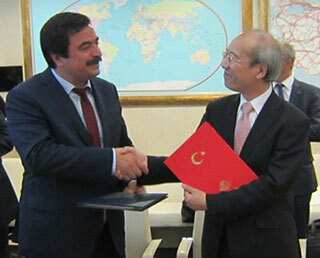 As Directorate General of Aeronautics and Space Technologies, the Ministry of Transport, Maritime and Communication of the Republic of Turkey, we are pleased with the studies which is conducted under the Memorandum of Understanding (MoU) on Satellite and Space Technologies signed between Turkey and Japan in 2010. Within this cooperation framework, we will perform joint experiments on International Space Station Japanese Experiment Module (KIBO) and jointly deploy a CubeSat from the International Space Station. We believe that such studies will serve as a bridge to strengthen the cooperation between our countries, and hope to elevate our cooperation to much higher levels than it is today. In this context, we would like to thank the Ministry of Education, Culture, Sports, Science and Technology (MEXT), the Minister for Space Policy of Japan and JAXA for their valuable contribution to our joint projects. We hope that our collaborative relationship will be further enhance especially in the space technologies field and Turkey-Japan friendship will continue to develop heretofore in the future. 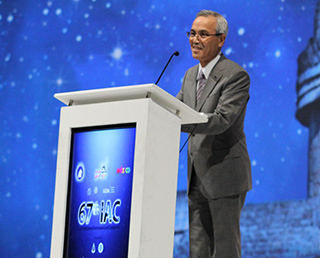 Mr. Kiyoshi Higuchi of JAXA completed his term as President of the International Astronautical Federation (IAF) at the 67th International Astronautical Congress (IAC) held in Guadalajara in September. He handed the Presidency over to Dr. Le Gall, President of the French Space Agency (CNES). 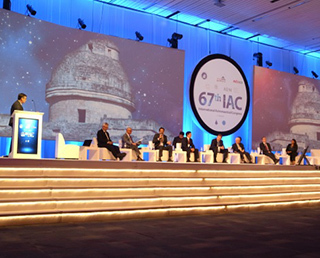 IAF is one of the co-organizers of the IAC. During his four-year term, Mr. Higuchi held four successful IACs and brought many changes to the Federation including the amendment of the IAF Constitution, increasing the membership by 81 to reach a total of 327 members, and promoting the involvement of emerging actors and the young generation. 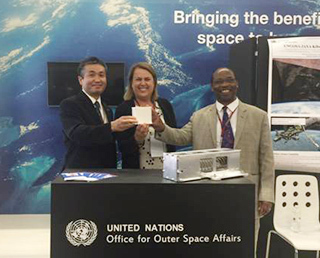 JAXA and the United Nations Office for Outer Space Affairs (UNOOSA) launched a three year “KiboCUBE” programme in September 2015, which offered developing countries the opportunity to deploy cube satellites from the Japanese Experiment Module “Kibo” on the International Space Station (ISS). This initiative aims to contribute to the technological advancement of space activities in developing countries by providing the opportunity to deploy micro-satellites using unique capabilities of Kibo. The applicants are the educational or research institutes in developing countries that are member states of the United Nations. JAXA held a media briefing with UNOOSA in the 67th International Astronautical Congress (IAC 2016) at Guadalajara, Mexico. During the briefing, there was an announcement of the second round along with introduction of the programme. Moreover, the representative of the University of Nairobi presented a summary of a satellite “1KUNS-PF”, which was the first to benefit from KiboCUBE. On September 26-30, Dr. Okumura and a number of JAXA staff participated in the International Astronautical Congress (IAC) held in Guadalajara, Mexico. This year’s IAC was attended by a record number of 5,000 participants from over 300 member organizations including space agencies, universities and industry. Dr. Okumura joined the Heads of Agencies Panel and the Space and Climate event, introducing JAXA’s activities as well as the importance of international cooperation. Dr. Okumura Visits U.S.A., Delivers Speeches in Washington D.C.
On September 22-23, President Naoki Okumura of JAXA visited Washington D.C. and met with the heads of NASA and NOAA, reaffirming to further strengthen mutual cooperation. Dr. Okumura also gave speeches at the Dirksen Senate Office Building and the Japanese Ambassador’s residence. The talks, attended by many participants related to the Congress, space agencies and industry, were valuable opportunities to provide an overview of the Japanese space plans and activities including future perspectives. On September 8, 2016, Mr. Yuichi Yamaura, Vice President of the JAXA and H.E. Dr. Cihan Kanl?goz, Director General of the Aeronautics and Space Technologies, the Ministry of Transport, Maritime Affairs and Communications of the Republic of Turkey, newly signed a Cooperation Arrangement concerning the utilization of the International Space Station (ISS) Japanese Experiment Module (Kibo). The cooperation is to offer opportunities to deploy a cube satellite (CubeSat) from the Kibo module and to conduct space experiments in an exposed environment using the Exposed Experiment Handrail Attachment Mechanism called ExHAM on board Kibo. 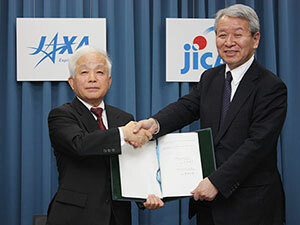 With this agreement, both parties intend to promote concrete cooperation by utilizing experience in the field of space technology and its utilization that JAXA has practiced. Both parties will discuss further to enhance the collaborative relationship in such areas as support for the establishment of a space agency, which the Republic of Turkey aims to, and promotion of capacity-building activities. 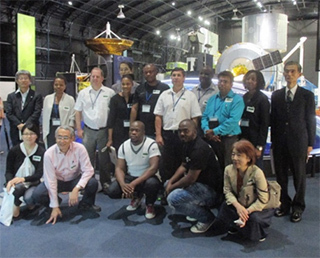 On June 15 and 16, 2016, remote sensing specialists namely from the South African National Space Agency (SANSA), together with the officers from the South African Maritime Safety Authority (SAMSA) and Department of Agriculture, Forestry and Fisheries (DAFF) visited JAXA’s Tanegashima Space Center and Tsukuba Space Center as part of the Earth Observation Capacity Development Program Focusing on Rader organized by the Japan International Cooperation Agency (JICA). The visit to Japan was a second part of a three-year JICA Program, which welcomed participants from a variety of agencies depending on the purposes of the satellite data use. Program participants visited the Tanegashima Space Center on June 15 and the Tsukuba Space Center on the following day. This was followed up with a seminar on JAXA’s earth observation activities, including earth-observation satellites such as DAICHI-2 (ALOS-2), and a lively Q&A session. The United Nations Office for Outer Space Affairs (UNOOSA) and JAXA have selected a team from the University of Nairobi to be the first to benefit from the UNOOSA-JAXA KiboCUBE programme. KiboCUBE was launched in September 2015 as a capacity-building initiative between UNOOSA and JAXA to offer educational and research institutions from developing countries the opportunity to deploy cube satellites (CubeSats) from the Kibo module of the International Space Station. Applications for the first round of KiboCUBE selection closed in March 2016 and a number of impressive applications were received. As the successful candidate, the University of Nairobi team plans to use its KiboCUBE CubeSat to test technologies it has developed for the future launch of a larger earth observation satellite. The team also hopes to apply data acquired from its CubeSat deployment to monitoring of agriculture and coastal areas. I am excited on the announcement by a cooperative effort by the United Nations Office for Outer Space Affairs (UNOOSA) and JAXA that a small satellite developed by University of Nairobi of Republic of Kenya will be deployed from the Japanese Experiment Module “Kibo” onboard the International Space Station (ISS) as the first satellite from the country. As “Kibo” is the only module onboard the ISS that has a capability to deploy small satellites, I am proud that JAXA is contributing to the development of space technologies of the various countries around the world utilizing the unique capacity of “Kibo”. “As the winner of the call for the the opportunity to launch our Cubesat through Japanese Experiment Module “Kibo” as a 'KiboCUBE' program, the University of Nairobi is very excited and the team plans to use its KiboCUBE CubeSat to test technologies developed for the future launch of a larger earth observation satellite. The team also hopes to apply data acquired from its CubeSat deployment in monitoring of wildlife migration, agricultural activities in coastal and semi-arid areas." 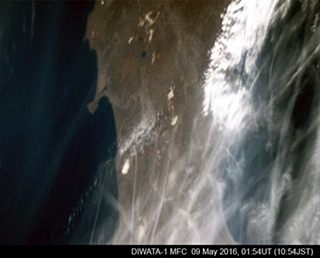 On June 2, Tohoku University released images of the earth taken by ‘DIWATA-1’, the first Philippine microsatellite successfully deployed from the ISS by Japanese Experiment Module, ‘Kibo’, on April 27. This satellite is one of a realization of international cooperation in peaceful uses of outer space through the close collaboration between Japan and the Philippines. A team of young engineers from the Department of Science and Technology (DOST) of the Republic of the Philippines, in collaboration withTohoku University and Hokkaido University were responsible for the development and production of this satellite. JAXA was in charge of its launch and deployment into orbit. The success of deploying this 50 kg-class microsatellite also signified that JAXA has enhanced its satellite deployment capacity in addition to that of the CubeSat-class satellite. The first joint committee between JAXA and the United Arab Emirates Space Agency (UAESA) was held on Wednesday, May 11, 2016 where both agencies entered into an interagency agreement earlier on March 22. 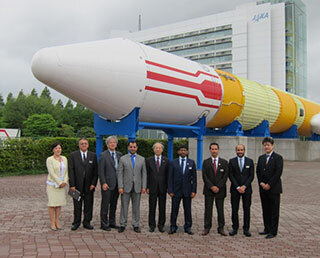 The conference was chaired by Mr. Yamaura, Vice President of JAXA Members, and was attended by UAESA members (H.E. Dr. Khalifa Mohammad Thani Al-Romaithi, Chairman, Dr. Mohammed Naser Al Ahbabi, Director General, Mr. Hamad Al Mutawa, Head of Strategic Partnerships) and Dr. Ilias M. Fernini Associate Professor from University of Sharjah, UAE). Participating members and representatives of various collaborative projects opened up the conference with current updates on the successful deployment of small satellites from the Japanese Experiment Module (‘Kibo’, which means ‘hope’ in Japanese) from the ISS, and the materials science experiments conducted with the Exposed Experiment Handrail Attachment Mechanism (ExHAM) of Kibo’s Exposed Facility. They also discussed the interoperability of deep space network and explored potential future collaborations. During the visit, the Japanese Government (Cabinet Office, Ministry of Education, Culture, Sports, Science and Technology, and Ministry of Economy, Trade and Industry) also signed a Memorandum of Cooperation with the UAESA on promoting the future exchange and collaboration in R&D, expertise/capacity development, and the creation of space-related industries between the two countries. The 10th International Society for Optics and Photonics (SPIE) Asia-Pacific Remote Sensing Symposium (APRS) was held in New Delhi, India from April 4 to 7, 2016. A special panel discussion featuring top-level space agency leaders from around the world was organized in the same symposium that commemorated the inaugural APRS conference in India and the 10th anniversary of SPIE. Mr. Shizuo Yamamoto, Vice President of JAXA (in charge of earth observations) was one of the panelists. 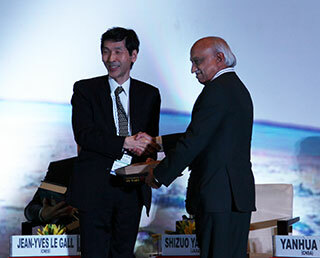 Photo: Mr. A. S. Kiran Kumar, Chairman of ISRO on the right with Mr. Shizuo Yamamoto, Vice President of JAXA at the conference venue. In the session led by space agency heads, Mr. Yamamoto cited real-world instances (using JAXA’s observation data) of how space technologies have become an indispensable element in solving the challenges posed by disaster prevention and climate change as part of the social infrastructure. He also introduced future plans and the activities of the Asia-Pacific Regional Space Agency Forum (APRSAF) as a regional collaboration. In the panel discussion, space agency heads discussed various challenges and effective utilization strategies to manage global climate change and natural disasters. They also actively exchanged opinions on the integration and standardization of observation data collected by each national agency, and the promotion of further cooperation and international collaboration between ground networks and space agencies. Reinforcement of international cooperation by leveraging space technology to its fullest is also required to deal with various global issues. Photo: Special panel discussion by space agency leaders (April 4) From left to right, Maj. Gen. Charles Frank Bolden, Jr. – Administrator of the National Aeronautics and Space Administration (NASA, USA), Mr. A. S. Kiran Kumar – Chairman of the Indian Space Research Organization (ISRO, India), Mr. Jean-Yves Le Gall – President of the Centre National D'Études Spatiales (CNES, France), Mr. Shizuo Yamamoto – Vice President of Japan Space Exploration Agency (JAXA, Japan), Mr. Yan Hua Wu – Deputy Administrator of the Chinese National Space Agency (CNSA, China), Mr. Alain Ratier – Director-General of European Organisation for the Exploitation of Meteorological Satellites (EUMETSAT), Dr. Francisco Javier Mendieta Jiménez – General Director of the Mexican Space Agency (AEM, Mexico). 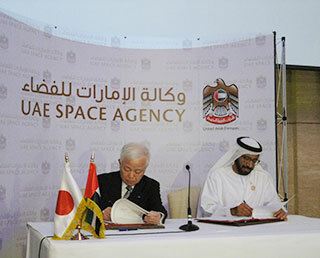 On March 22, 2016, Dr. Naoki Okumura, President of the JAXA and H.E Dr. Khalifa Mohammed Thani Al-Romaithi, Chairman of the Board of Directors for the UAESA, newly signed an “Arrangement between the Japan Aerospace Exploration Agency and the United Arab Emirates Space Agency regarding Cooperation in Space Activities and Use of Outer Space for Peaceful Purposes” to strengthen the cooperation between JAXA and UAESA. JAXA have already started cooperation with UAE including JAXA’s microwave discharge neutralizer onboard UAE’s “DubaiSat-2” satellite launched in 2013. The UAESA was newly established in 2014 and has been actively promoting space activities including the Mars exploration mission. With this Arrangement, both agencies intend to develop a mutually beneficial relationship by utilizing technologies and human resources for space exploration and utilization JAXA have accumulated for a long time. The both agencies will discuss further to enhance the cooperation in the areas such as research and development, space applications, utilization of the International Space Station (ISS) “KIBO,” capacity building, and so on. 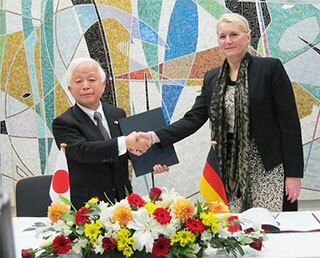 On February 25, 2016, the German Aerospace Center (Deutsches Zentrum für Luft- und Raumfahrt; DLR) and JAXA have signed an “Inter Agency Arrangement between DLR and JAXA for Strategic Partnership” at the German Embassy in Tokyo, Japan. With this arrangement, both partners intend to jointly undertake the new role of space agencies and significantly contribute to the advancement of the world's space development. In this context, DLR and JAXA intend to collaborate in the area of Space Utilization and R&D, use, for example, L- and X-band radar technologies for Earth observation, work together in disaster management, and conduct study into reusable launchers. Another important area is the exploration of the Solar System; at present, the DLR MASCOT lander is on board the JAXA Hayabusa 2 spacecraft, en route to asteroid Ryugu (previously 1999 JU3), where it will land after 2018 and explore its surface. Germany and Japan also utilise the International Space Station (ISS) intensively to answer questions in the fields of medicine, materials science and fundamental research. Photo: JAXA President Naoki Okumura (left) and Chair of the DLR Executive Board, Pascale Ehrenfreund (right) shake hands after signing. JAXA Space Education Center offers a space education seminar for educators in various Asian countries under the framework of the Space Education Working Group (SE WG) of the Asia-Pacific Regional Space Agency Forum (APRSAF). This fiscal year, we held a two-day seminar in Angeles city on February 16 and 17 for 25 high school science teachers from all over the Philippines. The contents of the seminar are customized according to the request of the host country. This year five activities, namely microgravity experiment, vacuum experiment, robot arm crafting, communication activity using rovers, and a lecture on the utilization of Earth observation satellites, were conducted. The teachers performed a mock class to implement what they had learned throughout the seminar. All teachers smoothly conducted their class while incorporating their own methods while teaching technical matters. We look forward to the implementation of their acquired knowledge to their real classes. Presentation at the Space Exploration Education Conference (SEEC) in Houston, Texas. JAXA sends Japanese educators who engage in space education to the Space Exploration Education Conference (SEEC) held in Houston every year. This year’s session from JAXA was performed by Mr. Aikawa from Okinawa Prefecture and Ms. Fukai from Hiroshima Prefecture. Mr. Aikawa’s presentation included constructing a plastic propeller stick and Ms. Fukai’s presentation had participants making an LED optical communication device. Prior to their presentation at SEEC, the selected teachers had the opportunity to visit a local elementary school and give their presentation directly to the local school children. This visit also allows the teachers to see what an American school is like and exchange ideas with the local teachers. 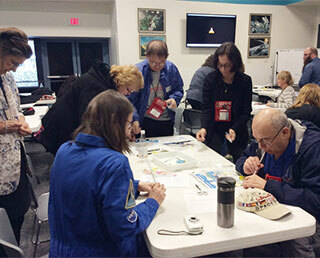 JAXA’s teachers were given two sessions to present during SEEC. In addition, JAXA staff and the selected teachers attended other sessions during the conference to learn what other teachers are doing in their classrooms in regards to space education. We then bring back what we learned and see how we could implement such activities in Japan. 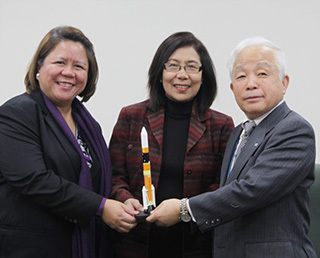 On January 12, 2016, Dr. Amelia P. Guevara, Undersecretary for Research & Development, and Dr. Rowena Cristina L. Guevara, Undersecretary for Science & Technology at DOST (Department of Science Technology of the Philippines) visited the JAXA Headquarters in Tokyo and had a meeting with Dr. Naoki Okumura, President of JAXA. They visited Japan in conjunction with the development of DIWATA -1 (DIWATA means fairy in Filipino), the first Filipino CubeSat developed jointly by DOST, the University of the Philippines, Tohoku University and Hokkaido University. DIWATA-1 will be the first 50KG class CubeSat to be deployed from“Kibo”by JAXA’s JEM Small Satellite Orbital Deployer (J-SSOD). The cost of deployment will be borne by the government of the Philippines, and an agreement was drawn up between JAXA and Tohoku University to allow DIWATA-1 to be deployed from “Kibo” for a fee. As the 23rd session of the Asia Pacific Regional Space Agency Forum (APRSAF-23) is scheduled to be held in the Philippines at the end of 2016, they also confirmed their expectation for increased interchange and enhanced cooperation through this meeting. On the following day, January 13, a hand-over ceremony of DIWATA-1 to JAXA and a press conference were held at Tsukuba Space Center. The CubeSat is equipped with four kinds of Earth observation cameras, and will be utilized for disaster monitoring, agriculture, forestry and fishery. The Philippine’s 50-kg-class microsatellite “DIWATA-1” has been received. DIWATA-1 will be released from Kibo this spring. On December 3, 2015, Dr. Thomas Djamaluddin, Chairman of the Indonesian National Institute of Aeronautics and Space (LAPAN) and Naoki Okumura, President of JAXA signed an agreement that has been revised to strengthen cooperation between JAXA and LAPAN in the field of aerospace research and development. 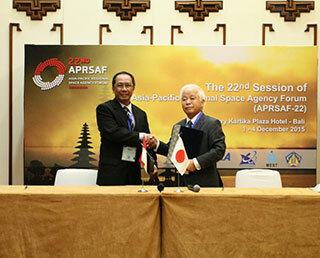 The signing ceremony for the Memorandum of Cooperation (MOC) between the two parties took place during the 22nd Session of the Asia-Pacific Regional Space Agency Forum (APRSAF-22), held in Bali, Indonesia. At the ceremony the heads of both organizations recognized the importance of solving social issues through the utilization of space technologies and their applications, and resolved to pursue deeper cooperation between the two agencies in the field of aerospace, and promote of the utilization of space for peaceful purposes through regional and global cooperation. The newly signed MOC includes potential cooperation in the fields of space science, and research and development in space exploration and aerospace technology, in addition to earth science, and the use of satellites in remote sensing, communication and navigation. 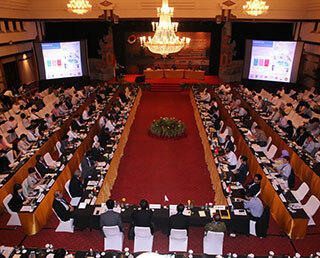 The 22nd session of the Asia-Pacific Regional Space Agency Forum (APRSAF-22) was successfully held from December 1 to 4, 2015 in Bali, Indonesia, jointly organized by the Ministry of Research, Technology and Higher Education of Indonesia（RISTEK-DIKTI）, the National Institute of Aeronautics and Space of Indonesia （LAPAN）, the Ministry of Education, Culture, Sports, Science and Technology of Japan (MEXT) and the Japan Aerospace Exploration Agency (JAXA). APRSAF, established in 1993, has been growing to become one of the largest international forums today in the Asia-Pacific region. It is annually organized by MEXT, JAXA and organizations of host countries. APRSAF-22 was organized under the main theme entitled “Sharing Solutions through Synergy in Space” with the aim of further promoting regional cooperation. The participants -- around 480 representatives and experts from 28 countries and regions and from 10 international organizations -- actively contributed to discussions on various topics under the main theme. On December 1, the Japan International Cooperation Agency (JICA) and the Japan Aerospace Exploration Agency (JAXA) announced the Initiative for Improvement of Forest Governance at the twenty-first session of the Conference of the Parties (COP21) to the United Nations Framework Convention on Climate Change (UNFCCC) in Paris. The initiative will create a new tropical forest monitoring system that tracks deforestation and forest loss with JAXA’s Advanced Land Observing Satellite-2 (ALOS-2). The initiative will be conducted by a partnership between JICA and JAXA, and supporting private corporations are expected to join the initiative to contribute to the conservation of the world’s tropical forests. Activities will include building a forest monitoring system, training human resources in developing countries on how to use the system, and spreading knowledge about successful forest conservation projects around the world. The forest monitoring system will maintain a constant watch on deforestation and forest loss in tropical regions of the globe and provide open access to its findings. With a resolution to 50 meters, the findings of the monitoring system will be updated about every six weeks on average to the JAXA website and other resources by March 2017. It is expected that these efforts will help countries with serious deforestation issues restrain illegal logging, and in the long term, help control the reduction of forests as an effective measure against climate change. Tropical forests serve as an immense storage tank to hold carbon dioxide in the form of carbon, and conserving the forests is critical in the fight against climate change. However, the loss of tropical forests continues unabated due to illegal logging and other factors, and implementing measures to stop the loss is a global priority. Aboard the ALOS-2 satellite is PALSAR-2 (L-band Synthetic Aperture Radar-2), a system that uses L band radio waves suitable for forest observation and capable of monitoring the ground surface 24 hours a day regardless of weather. PALSAR-2 can thus monitor for illegal logging and other changes in tropical forests despite the cloud cover that is typical found in such areas. With technical cooperation provided by JICA in Brazil from 2009 to 2012 and data gathered by ALOS, the predecessor to ALOS-2, illegal foresting was monitored and assistance provided in near-real time. More than 2,000 incidents were discovered and the action taken contributed to a 40 percent reduction in the amount of forest area destroyed. The ALOS-2 improves on the earlier satellite model by using two types of reflecting radio waves that make it possible to analyze the data and detect deforestation with greater precision. 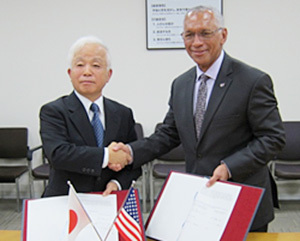 JICA and JAXA signed a partnership agreement in April 2014 with the objective of using aerospace technology to solve the many development challenges that developing countries face along with global issues. The Initiative for Improvement of Forest Governance with its incorporation of ALOS-2 was launched under the framework created by that agreement. Both agencies will continue to use satellite technology to conserve the world’s tropical forests. * Polygon shapes outline areas where forest loss has been detected. The data will be provided about every six weeks in images with a resolution of 50 meters showing reduced forest cover. International Advisory Board Workshop "Assessing the Impact of Satellite Earth Observation on Society and Policy"
JAXA organised an International Advisory Board on 9-10 November 2015 in Tokyo jointly with the National Institute of Information and Communications Technologies (NICT), Keio University, Institute for Global Environmental Strategies (IGES), in support of the project funded by Japan Science and Technology Agency (JST), with the goal of "Assessing the Impact of Satellite Earth Observation on Society and Policy". A series of discussions invited perspectives from experts to understand how Earth observations contribute to environmental and other policy-making, and how space agencies establish links between their programmes, scientific advance, industrial innovation, and societal well-being. The Advisory Board concluded with some *key findings* from the two days of meetings. 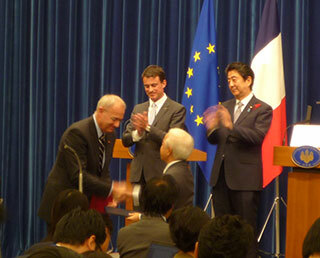 Dr. Naoki Okumura, President of the Japan Aerospace Exploration Agency (hereinafter referred to as JAXA), and Dr. Jean-Yves Le Gall, President of the Centre National d’Etudes Spatiales (hereinafter referred to as CNES), signed the revised agreement for the "Inter-Agency Arrangement between NASDA and CNES Concerning the Preparation of a Long Term Cooperation in the Field of Space Programs " on 5 October 2015. The purpose of the revision is to achieve effective cooperation between space agencies of Japan and France, in light of the changes in the business environment., This includes the increasing presence of emerging countries and the private sector in space development and utilization, as well as changes in Japan such as the enactment of the new Basic Plan for Space Policy and the transition of JAXA to a National Research and Development Agency. On the occasion of the visit by Mr. Manuel Valls, Prime Minister of France to Japan, the exchange ceremony of signing agreement took place at the Prime Minister’s Office of Japan in the presence of Prime Ministers Shinzo Abe and Manuel Valls. JAXA and the United Nations Office for Outer Space Affairs (UNOOSA) agreed to cooperate in providing opportunities to deploy cube satellites (CubeSats) from the Japanese Experiment Module “Kibo” of the International Space Station (ISS). 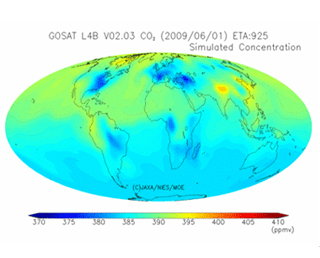 The Ministry of the Environment (MOE), the Japan Aerospace Exploration Agency (JAXA), the National Institute for Environmental Studies (NIES), and the National Aeronautics and Space Administration (NASA) have come to an understanding regarding cooperation on the Greenhouse Gases Observation Satellite (GOSAT), the Greenhouse Gases Observing Satellite-2 (GOSAT-2) and the Orbiting Carbon Observatory-2 (OCO-2) missions. H.E. 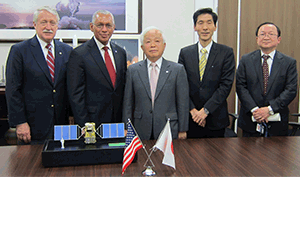 Mr. Mochizuki, Minister of the Environment, Dr. Okumura, President of JAXA, Dr. Sumi, President of NIES and Mr. Bolden, Administrator of NASA, signed a Memorandum of Understanding on March 17, 2015, in Tokyo. GOSAT, its successor GOSAT-2, and OCO-2 are satellite missions that observe the concentration and distribution of greenhouse gases in the Earth’s atmosphere from outer space for the purpose of studying climate change. In addition, GOSAT/GOSAT-2 contribute to the international effort toward the prevention of warming, including monitoring greenhouse gas absorption and emissions. 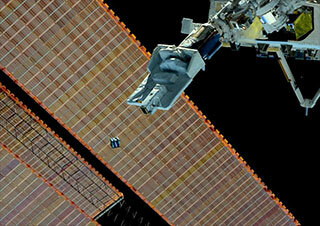 The calibration and validation of space-based greenhouse gas data among different satellite missions has been limited. Cooperation under this MOU will enable the Parties to improve the quality of satellite data through calibration campaigns and the effective use of ground-based observation data. Under the MOU, the Parties will cross-calibrate instruments on the 3 CO2 missions, implement common validation, participate in joint mission science teams, and conduct joint presentations in international conferences. 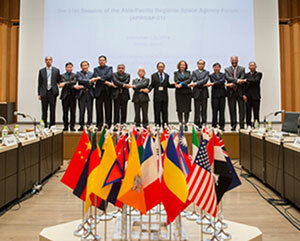 The 21st session of the Asia-Pacific Regional Space Agency Forum (APRSAF-21) was successfully held from December 2 to 5, 2014 at the National Museum of Emerging Science and Innovation (Miraikan) and the Tokyo International Exchange Center (Plaza Heisei), jointly organized by the Ministry of Education, Culture, Sports, Science and Technology of Japan (MEXT) and the Japan Aerospace Exploration Agency (JAXA). APRSAF, established in 1993, is the largest international forum in the Asia-Pacific region, annually organized by MEXT, JAXA and local host organizations. It was the first time in nine years since APRSAF had been held in Japan last time. Reaching a record high of 580 participants from 33 countries/regions and 12 international organizations, participants actively discussed under the main theme titled “Leap to the Next Stage: Delivering Innovative Ideas and Solutions” to promote further regional cooperation. Based on the Recommendations agreed in APRSAF-20 last year, newly-structured four working group sessions (Space Applications, Space Technology, Space Environment Utilization, and Space Education) were held in parallel in the first two days of APRSAF-21. Participants of the working groups confirmed the status of regional cooperative projects and discussed future activities in the areas of disaster management, environmental issues, utilization of the International Space Station (ISS), education and capacity building, etc. At the plenary session in the latter two days, activity reports were made by representatives from space agencies and related ministries in the region and international organizations. The special session titled “Societal Needs and Space for Practical Applications” was organized with the participation of space agencies, local implementation organizations and development aid agencies. Another special session titled “ISS and Beyond – Toward Global Space Exploration,” moderated by Mr. Soichi Noguchi, Japanese Astronaut and President of the Association of Space Explorers, also took place for sharing significance and prospect of human space activities, and then special presentations on international space exploration were delivered. Furthermore, the Asia-Pacific Space Leaders Meeting (AP-SLM) session was held in the afternoon of December 4 with the participation of high-level officers from space agencies and related ministries in the region and announced the Joint Statement for promoting further regional cooperation. During the week, there were also relevant events in conjunction with APRSAF-21 such as workshops of international projects (“Initiatives”) created through APRSAF (SAFE and Kibo-ABC), educational activities for the young generation (a water rocket event and a poster contest), and an exhibition. It was announced that the next session, APRSAF-22, will be hosted by National Institute of Aeronautics and Space of Indonesia (LAPAN), MEXT and JAXA and will take place in Denpasar, Indonesia. The Japan Aerospace Exploration Agency (JAXA) and the National Aeronautics and Space Administration (NASA) came to an understanding regarding a Hayabusa2-OSIRIS-REx (Origins-Spectral Interpretation-Resource Identification-Security-Regolith EXplorer) mission agreement and Dr. Okumura, President of JAXA and Mr. Bolden, Administrator of NASA signed the Memorandum of Understanding on November 17, 2014 at the JAXA Tokyo Office. Asteroid explorer “Hayabusa2” will detect clues regarding the mystery of the origin and evolution of the Earth, sea and life by conducting sample return from a carbonaceous asteroid (C-type), which is more primitive than the asteroid Itokawa (S-type) explored by asteroid explorer “Hayabusa”. Furthermore “Hayabusa2” will lead the world by developing and maturing the deep space round-trip exploration technology that was demonstrated by “Hayabusa”, through new technological challenges such as creating an artificial crater on the asteroid. Similar to JAXA-NASA cooperation on the original Hayabusa mission, NASA provides support for Hayabusa2 including the NASA Deep Space Network which enables advanced and reliable mission operations. In addition, through scientific cooperation, asteroid sample exchange and joint participation during key mission phases with NASA’ s asteroid explorer OSIRIS-REx, JAXA and NASA will mutually maximize their missions’ results. OSIRIS-REx is scheduled to be launched in 2016, and its primary objective is also sample return from a carbonaceous asteroid. JAXA Vice President Shizuo Yamamoto assumed the post of Chairman of the CEOS. On Oct. 30, JAXA Vice President Shizuo Yamamoto assumed the post of Chairman of the Committee of Earth Observation Satellites (CEOS.) The CEOS was established in 1984 to internationally coordinate activities of Earth observation missions from space. It is the only organization that specializes in Earth observation satellites in the world. For the last 30 years, the CEOS has been organizing Earth observation satellite missions planned by each country to facilitate collaboration with data users by promoting data sharing and problem solving for social issues by using acquired data. The year 2015 will be important to plan future Earth observations while JAXA plays the important role of the chairmanship of the CEOS. In this coming March, the United Nations World Conference on Disaster Reduction is scheduled to establish the international disaster preparation framework action plan, the post-Hyogo framework, for the next 10 years. The Group of Earth Observations will also decide the Earth observation strategic plan for the next 10 years within 2015. In the last 30 years, observation methods have been improving and diversifying thanks to technological developments; therefore, we are in an era of using space to solve social issues that Earth observation technologies face. 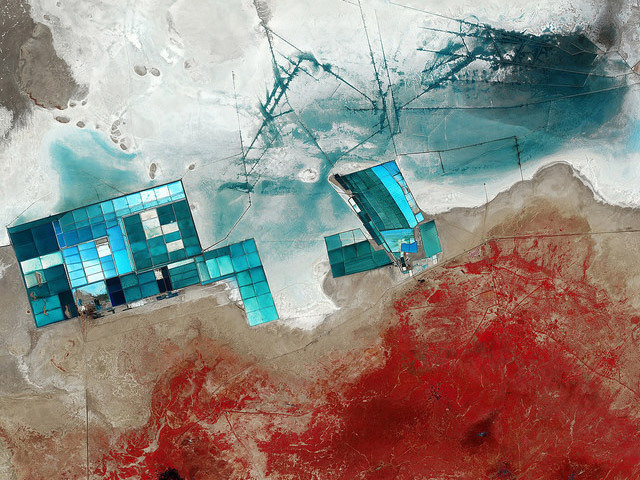 For that, Earth observation satellites are expected to contribute to solving various issues for human beings with many projects and missions around the world through GEOS. JAXA assumes the CEOS chairmanship for a year until November 2015, and will promote the important role played by Earth observation satellites while aiming at making contributions to various activities in the next 10 years. A party led by Mr. Nguyen Xuan Phuc, Deputy Prime Minister of the Socialist Republic of Vietnam, visited the Tsukuba Space Center on October 10, 2014. JAXA President Naoki Okumura welcomed the party of 42 consisting of seven minister-level members including Prof. Dr. Chau Van Minh of the Vietnam Academy of Science and Technology (VAST) and media people from Vietnam. In conjunction with this visit, JAXA-VAST collaboration results were confirmed and a Joint Statement of Intent for Enhancing Partnership between VAST and JAXA was signed in the presence of Deputy Prime Minister Phuc. Pertinent agencies in Vietnam and JAXA are jointly working for various projects such as co-hosting the Asia-Pacific Regional Space Agency Forum (APRSAF), use of satellite data, development of a small satellite and its release from the Kibo on the International Space Station, and human resourse development. International cooperation is indispensable in many areas of aerospace activities. JAXA hopes to contribute to promoting space technology development and utilization and construction of good relations between Japan and those countries in facilitating effective cooperation with pertinent agencies in each country. 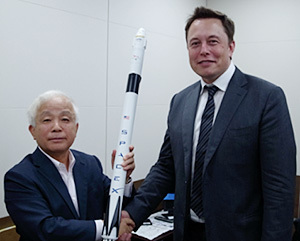 Dr. Naoki Okumura, President of JAXA received a courtesy call from Mr. Elon Musk, CEO/CTO of Space Exploration Technologies (SpaceX), September 9, 2014 during his visit to Japan. They exchanged their views on current technical challenges, future space development including space transportation systems, space market. And also they exchanged their management vision. Both JAXA and SpaceX agreed on continuing their efforts to strengthen their contribution for space development. JAXA and Norway Space Centre (NSC) hosted the First JAXA-NSC Polar Workshop on Friday, March 28, 2014 at the Royal Norwegian Embassy in Tokyo. 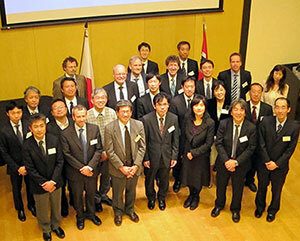 This workshop was held under the JAXA-NSC agreement for cooperation in the civil uses of outer space. The experts from NSC, JAXA, and the organizations related to polar researches attended the workshop and discussed issues involving polar researches and space. The workshop helped to advance participants’ mutual understanding. Japan and Norway have a long history of cooperation. Japanese sounding rockets have been launched from Andøya Rocket Range and Svalbard in Norway; and the data from JAXA’s Earth Observation satellites, including Shizuku (GCOM-W1) and Ibuki (GOSAT), has been received at the Svalbard station. The issues in the arctic region - environmental management, energy and resources, fishing resources, Northern Sea routes, etc. - have become internationally critical. Eight countries in the Arctic region including Norway established the Arctic Council in 1996 to discuss common issues. The importance of the Arctic Region to Japan has also been rising and last year Japan became one of the observers of the Arctic Council, contributing through participation to working groups and other occasions. NSC and JAXA both recognizes the importance of NSC-JAXA bilateral cooperation for Earth Observation and polar researches. At the workshop, among various topics, potential cooperation projects such as observation of sea ice in the Northern Sea and comparison of radar data from European and Japanese satellites were suggested. 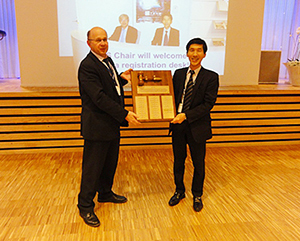 NSC and JAXA agreed to continue the dialogue and to hold the 2nd Polar Workshop in early 2015 in Norway. With this partnership agreement in place, collaboration between JICA and JAXA is expected to strengthen, and higher quality cooperation will be implemented in developing countries utilizing aerospace technologies. The 20th session of the Asia-Pacific Regional Space Agency Forum (APRSAF-20), under the main theme entitled "Values From Space: 20 years of Asia-Pacific Experiences," successfully concluded its four-day program on Friday, December 6, 2013, at Melia Hanoi Hotel, in Hanoi, Vietnam. APRSAF-20 was jointly organized by the Vietnam Academy of Science and Technology (VAST), the Ministry of Education, Culture, Sports, Science and Technology of Japan (MEXT), and the Japan Aerospace Exploration Agency (JAXA). Approximately 420 participants from 28 countries and 8 international organizations attended the session. APRSAF-20, as in the past, consisted of four working-group sessions that were held in parallel in the first two days and a plenary session in the second half of the forum. There were also relevant events in conjunction with APRSAF-20 such as a water rocket event, a SAFE workshop, a Kibo-ABC workshop, a poster contest, and an exhibition. Dr. Keisuke Isogai, Deputy Director General, Research and Development Bureau, MEXT, participated in the event as the general co-chair, Mr. Eigo Nomura, Counsellor, Office of National Space Policy, Cabinet Office of JAPAN, made a keynote address, Prof. Setsuko Aoki, Faculty of Policy Management, Keio University, made a special speech in the plenary session. Annual activity reports were made by space agency representatives from each country. Dr. Naoki Okumura, President of JAXA, reported on the recent JAXA activities (the deployment of the Vietnam small satellite "PicoDragon" from the ISS, the inaugural launch of the Epsilon rocket, Earth observation projects on disaster management and environment) and a future action plan (GPM and ALOS-2 satellites), and expressed the expectation for further development of the APRSAF. We also had presentations from international organizations such as the Group on Earth Observation (GEO), the United Nations Committee on the Peaceful Uses of Outer Space (UN-COPUOS), the United Nations Economic and Social Commission for Asia and the Pacific (UN-ESCAP) and the International Astronautical Federation (IAF) about their expectations for expansion of cooperation in the region. This time, the first trial of its kind in APRSAF has been made. The first joint statement for further space cooperation in the region by representatives from space agencies in the Asia-Pacific and past co-organizers of APRSAF was released through a panel discussion at the plenary. As part of a memorable 20th session, a special event "Values From ISS," moderated by Dr. Satoshi Furukawa, Japanese Astronaut, also took place and a video message from Dr. Koichi Wakata, the Japanese Astronaut now aboard the International Space Station (ISS), was delivered from space. At the event, some cooperation missions were introduced with Asian countries for the utilization of the Japanese Experiment Module "Kibo" to encourage further cooperation in the region through the ISS. It was announced at the last plenary session, on December 6, that the next session, APRSAF-21, will be hosted by MEXT and JAXA and would take place in Tokyo, Japan.